Cub French Blue Shadow Stripe Bags 250 Pk 8-1/4x4-3/4x10-1/2"
Cub size French Blue Kraft Shadow Stripe Shopping Bags by the carton are made from 50% recycled paper. Produced with water based inks and glues. Made in the USA. 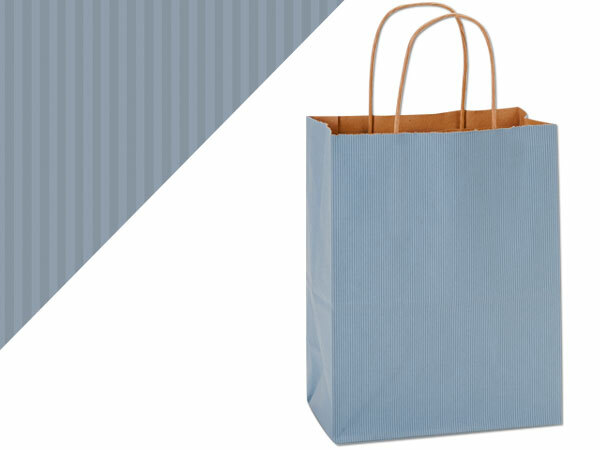 The pinstripe on these kraft color gift bags creates an upscale look at wholesale prices! These bags come in a wide variety of colors ranging from bright pink and yellow to the more traditional red and black! We offer these bags in small, medium, large and jumbo sizes, with an assortment of sizes available! You can easily dress up these bags for any occasion with our printed tissue paper! All of our shadow stripe paper shopping bags contain a minimum of 40% recycled and proudly Made in the USA!